Hello again! It’s been awhile since I’ve updated any new recipes. Life always seems to get in the way like that. Soccer, crazy busy work schedules and traveling have taken up a large portion of our summer! I wanted to get started again by throwing up a really simple recipe that tastes amazing! 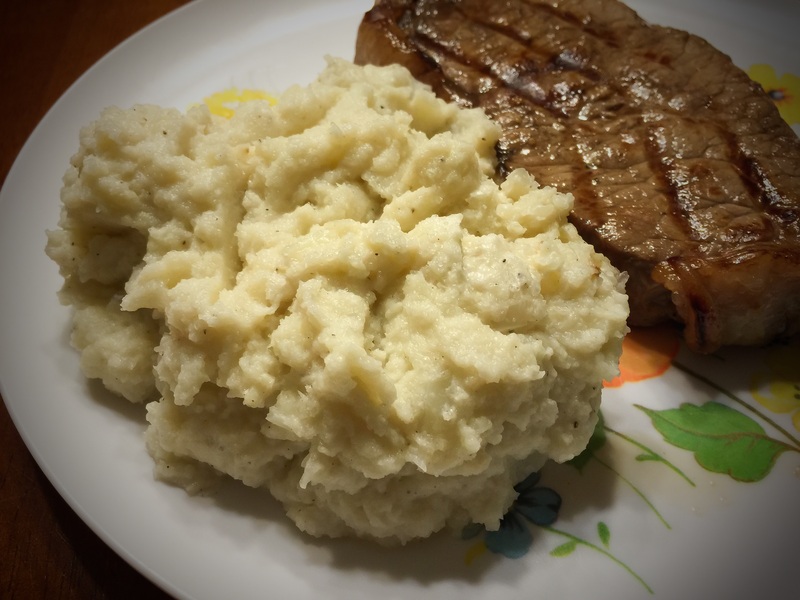 Mashed potatoes are one of those foods that goes so well with any meat. So naturally someone somewhere came up with a keto variation as a substitute. (Those keto folks sure are inventive!) Garlic Mashed Cauliflower is a great side dish! Check it out! First you need to steam your cauliflower. There are many ways to do this but for us the simplest is to place the cauliflower into a medium pan with an inch of water, cover with a lid and simmer on medium low for around 10 minutes or until tender. Drain well. While the cauliflower is steaming place your olive oil in a small skillet over medium heat. Add your smashed garlic and cook it, stirring often, until it is tender. This takes about 2 minutes. Transfer half the cauliflower to a food processor (We love our Ninja Professional Blender ), cover and blend on high. Add the remaining cauliflower a little at a time until they are creamy. Blend in garlic/olive oil, parmesan cheese, cream cheese, salt, and black pepper. It’s simple and delicious and we love it! Enjoy! This entry was posted in Recipes, Side Dishes by Jeff Levers. Bookmark the permalink.